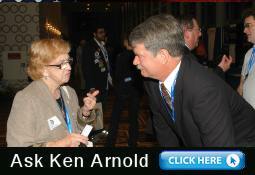 Thank you for visiting Ken Arnold for Congress. Your privacy is important to us. To better protect your privacy, we provide this notice explaining our online information practices and the choices you can make about the way your information is collected and used at this site. At our site, you may be able to participate in online polls to express an opinion, make comments or suggestions. We also may collect certain non-personally identifiable information when you visit many of our web pages such as the type of browser you are using and the domain name of your Internet service provider. We do not attempt to collect personal information, except as you specifically provide it on certain pages. Any personal information voluntarily provided, will only be used for purposes of the campaign and will not be shared beyond the campaign, other than with trusted vendors for purposes such as campaign related mailings. We sometimes use the non-personally identifiable information that we collect to improve the design and content of our site and to enable us to personalize your Internet experience. We also may use this information in the aggregate to analyze site usage, as well as to offer you products, programs, or services in the future. Finally, the Ken Arnold for Congress site covered by this Privacy Notice will not use or transfer personally identifiable information provided to us in ways unrelated to the ones described above without also providing you with an opportunity to opt out of these unrelated uses. Our site has security measures in place to protect the loss, misuse and alteration of the information under our control. Unauthorized use, tampering with or modification of this system -- or its supporting hardware or software -- may violate federal or other statutes and may subject the violator to criminal and civil penalties. In the event of unauthorized intrusion, all relevant information regarding possible violation of law may be provided to law enforcement officials.